Newton's orbital thought experiment. Imagine shooting a cannonball from a cannon parallel to the surface of the Earth from a high mountain. The faster the cannonball moves, the further it would travel before hitting the Earth. At a certain speed, the cannonball would fall around the curving Earth, and would come back and hit the cannon. Such a path is called an orbit. If the cannonball were above the Earths atmosphere, so that there was no friction with the air, it would just go around and around forever. The cannonball is in "free fall"- it is falling around the Earth- but it never gets any closer to the surface! 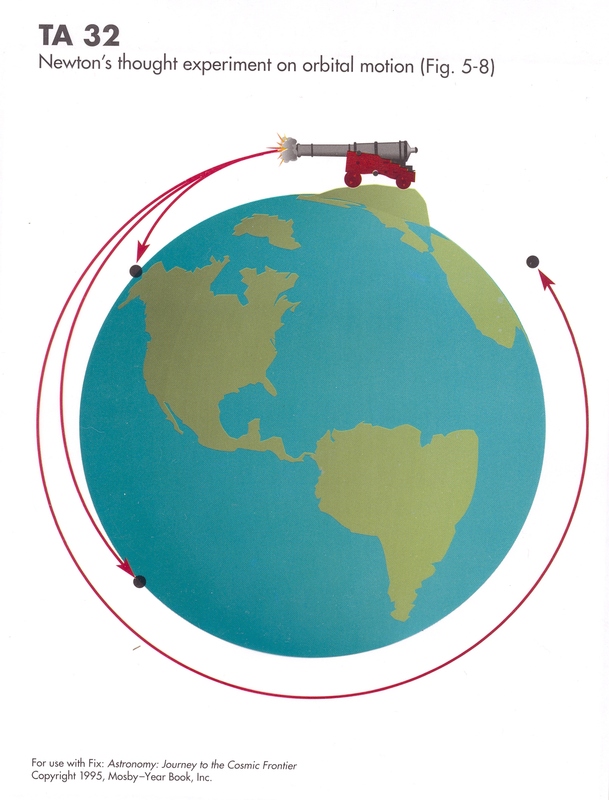 Once in orbit, the cannonball does NOT need any additional push or thrust to keep moving- NO rocket motors etc. In fact if you did, say, fire a rocket attached to the projectile to increase its speed (but maintaining the velocity vector direction) the projectile would NOT be able to stay in the same orbit. 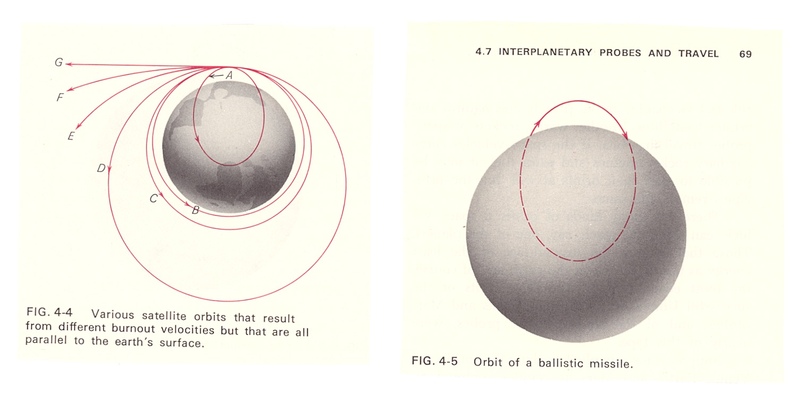 The speed of an orbiting body and the time to complete one orbit (orbital period) depends on the masses of the bodies and the distance between them. It takes about 90 minutes to orbit the Earth in a low Earth orbit (a few hundred miles above surface). The speed in such an orbit is about 18,000 mph, approximately 30 times the speed of an airliner. The Space Shuttle is in such a low Earth orbit and so takes about 90 minutes to circle the globe once. Newton thought experiment. This is basically same as the previous Newton thought diagram, but with a little more detail. The curves labeled A to G show the effects of increasing speed for the projectile. A shows a speed significantly less than the circular speed- this results in an elliptical orbit that intersects the Earth. (See also Fig 4.5). The portions of the orbit which are external to the Earth are indeed the same as an elliptical orbit around a point mass at the Earth's center. B shows an (elliptical) orbit resulting from an inital speed which is only slightly less than the circular orbit at the initial height. C shows the circular orbital speed. D shows an initial speed greater than the circular speed, but less than the escape speed, resulting in an elliptical orbit. E shows part of the path of an object launched with just the escape speed- it is a parabola. F shows the path of an object launched with somewhat more than the escape speed. G shows the path of an object launched with many times the escape speed. F and G paths are both hyperbolas and represent unbound orbits- the projectile will never return to the vicinty of the Earth. Drawing an ellipse.. (a) You can draw an ellipse with two thumbtacks (the two foci) and a loop of string. If you keep the string tight and pull the pencil around the foci, you get an ellipse. 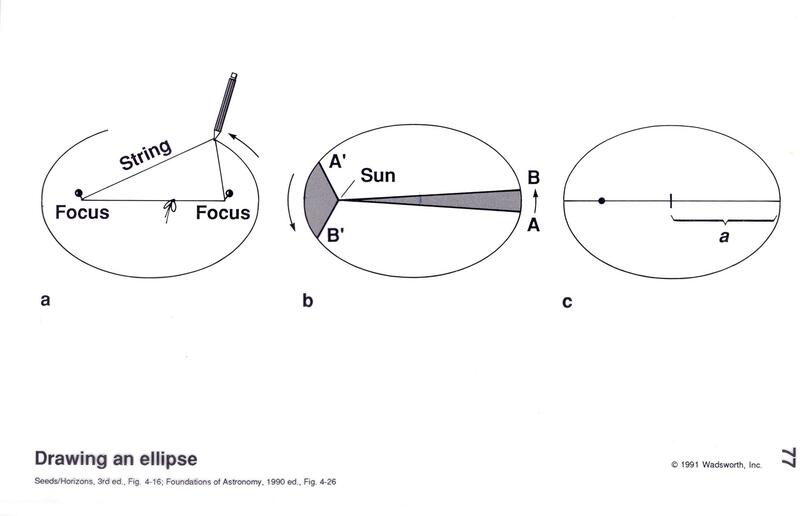 (b) Keplers first law of planetary motion is that each planet orbits the Sun in an ellipse, with the Sun at one of the foci of the ellipse, NOT at the center of the ellipse. (c) The long axis of the ellipse is called the major axis. Half of the major axis is the "semimajor axis" and is usually given the symbol a, as shown in diagram. Ellipse of varying shapes (eccentricity). 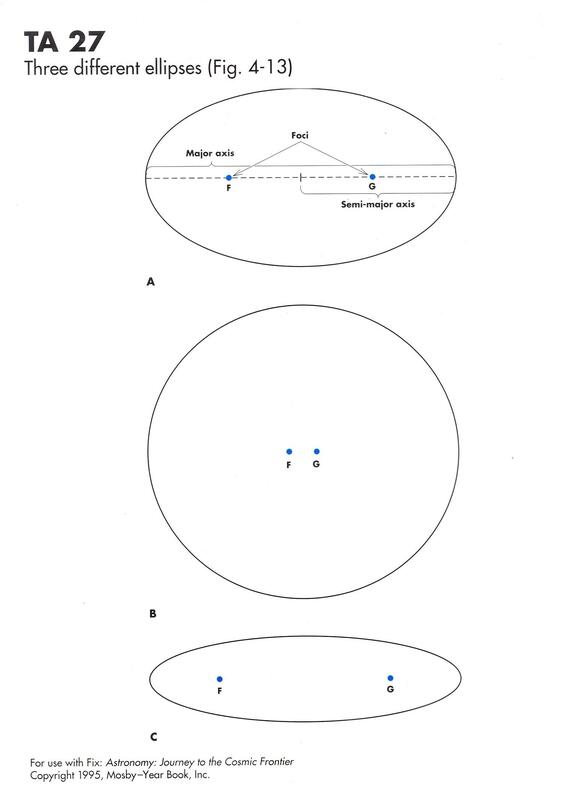 (A) An ellipse, showing foci, major axis, and semimajor axis. (B) An ellipse where the distance between the foci is small compared to the length of the semimajor axis. This ellipse is not too much different in shape from a circle. This ellipse has a low eccentricity. (C) This ellipse has a higher ratio of the distance between foci compared to the semimajor axis than the ellipse in B. This ellipse is much more "out of round" than the previos one, and has a higher eccentricity. 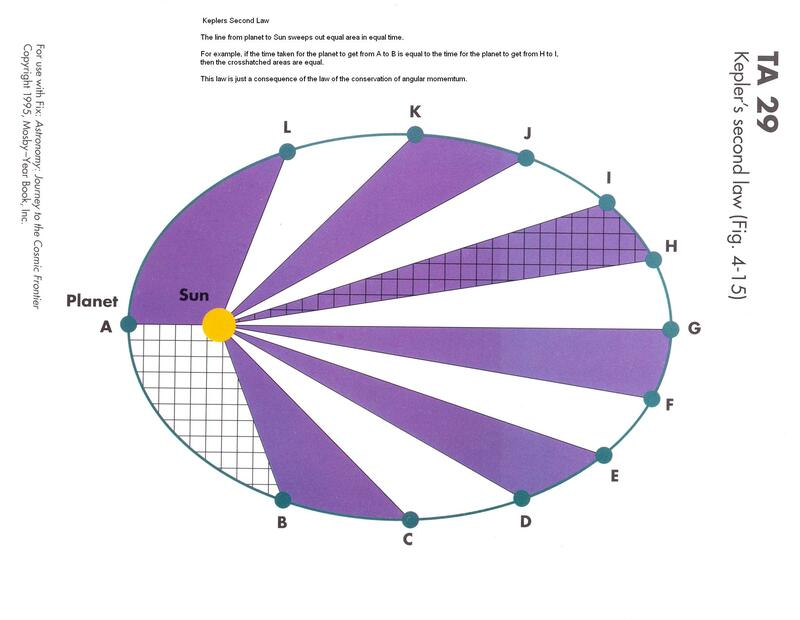 Kepler's second law Keplers second law (the "equal area" law) states that the area swept out by the line between planet and Sun is equal for equal time. The planet would take the same amount of TIME to go from A to B as from B to C, etc. For example, the area of the cross-hatched region between points A, B and Sun would be equal to the cross-hatched area between point H, I and the Sun. As the distance between A and B along the orbit is larger than the distance between H and I along the orbit, but the time the same, the planet must move faster between A and B than between H and I.